Should I Buy a Radial Farm Tire? By the mid-1970s, almost every car in the United States had converted from bias tires to radial tires. However, scroll through pictures of farm equipment from the 1980s, 1990s, and even the early 2000s and, with a few exceptions, the machines are equipped with bias tires. Now, after years of perfecting high-performing radial technology in large tires for farm machinery, growers have better choices than ever. From a distance, bias and radial tires don’t look all that different except for the telltale bulge of the radial just above the footprint; but, beneath the black exterior and bar lug treads, today’s radial tires possess a collection of technology that enables improved efficiency, increased capacity, and better bottom lines. Below are a few of the advantages to be found by using radials on your farm equipment. Automobiles abandoned using bias tires in the 1970s for a variety of reasons, with the most notable one being that radials simply deliver a better ride. Unlike bias-ply tires, which are relatively rigid and can create a wandering sensation as they seem to follow ruts and breaks in the road, radial tires conform to the road’s surface, enabling them to float over uneven road surfaces. The increasing amount of time today’s farm equipment spends on the road is one of the many reasons why radials are becoming more commonplace. It’s not just the lack of wandering that makes radials superior to bias tires on the road. Because of the way radial tires are constructed, they dissipate heat better than bias-ply tires, which makes them capable of traveling at higher speeds and covering longer distances than their bias counterparts. One of the most significant reasons for the popularity of radials is their ability to reduce the impact of farm equipment on the ground and reduce soil compaction. The footprint of a radial tire can be as much as 25% larger than a comparable bias-ply tire, which helps to better distribute the weight of a machine and minimize compaction—protecting both yields and profits. From tractors to combines to self-propelled sprayers, today’s farm equipment is bigger and more powerful than ever before. However, a high-horsepower machine delivers its full value only if it’s able to put all of its power to work. Thanks to the larger footprint and unique construction of radial tires, they deliver better traction, less slippage, and full use of your machine’s power. Improved traction and less slippage isn’t only good for making the most of your equipment’s power, it’s also good for reducing your farm’s fuel consumption. Slipping tires burn excess fuel and can cause rutting, which in turn burns even more fuel. Even worse, rutting is also bad for both the soil and yields. And radials encounter less rolling resistance, which improves fuel efficiency even further. Radial tires don’t only save you money in fuel, they can also save you money at the tire dealer. Radials have a longer service life than bias-ply tires, reducing the cost of replacement. Furthermore, since radials are designed to flex, they are better able to float over the ground, and more resistant to stubble chunking and chipping the tread, which is great for extending service life, reducing the chance of a puncture, and reducing downtime. The sidewalls on a radial tire are designed to flex—because of this, radials absorb shocks, bumps, and jolts better than bias-ply tires. A less-jarring ride helps keep operators fresh and productive, which is especially important during the busiest days and weeks of the year (like fieldwork, planting, and harvest, for example). More so, smoothing out the ride reduces wear and tear on expensive farm equipment. Like supercharged radials, tires with IF/VF technology are designed to flex even more than traditional radials. IF tires can carry 20% more load at the same inflation pressure as a conventional radial, or the same load at 20% less pressure—and that number jumps to 40% for VF tires! There are some applications when a bias-ply tire is the best choice. Bias tires are still a popular choice for equipment that operates at lower speeds and will see minimal use on the road. Because of the way bias tires are constructed—they’re very stiff and stable—they are well-suited for many dump truck operations and adept on hillsides. The manner that bias-ply tires are constructed also blesses them with durable sidewalls, making them a smart choice for machines operating in terrain with sidewall-threatening stumps and rocks. Of course, another reason for some people’s bias for bias-ply tires is that they’re less expensive up front than radials. 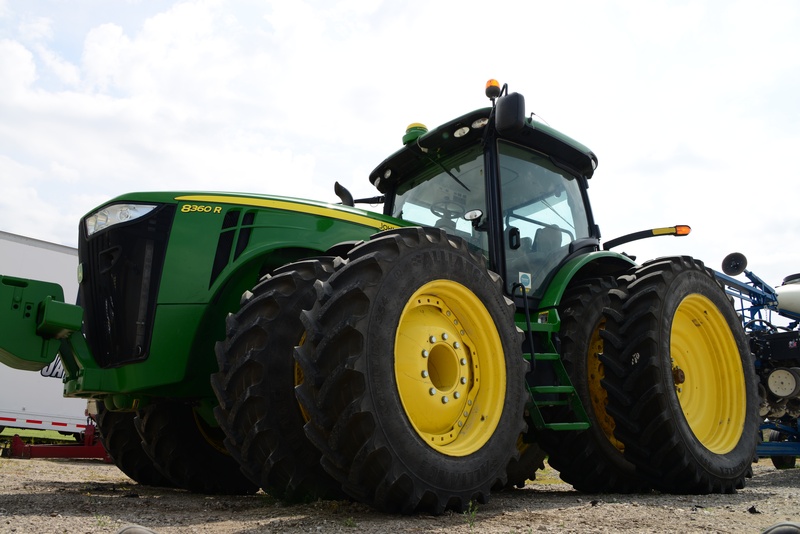 Choosing the right farm tires has immense benefits, and radials are increasingly being called upon to help farmers meet the challenges facing them. To learn more about Alliance’s line of application-specific ag tires, contact your local ATG dealer today!